Ever since I met a baby llama at the Central Park Zoo’s Children’s Zoo a few years ago, I’ve been completely obsessed with the goofy, long-necked fluffy animals. And after a recent brunch at Williamsburg’s Llama Inn with my sister, I’m kind of obsessed with that too. We started off with pan de yuca, a simple but tasty Peruvian inspired take on bread and butter. Each little bun, soft and sweet, is made from the hispanic staple and root veggie, yuca. With it, a velvety, creamy sweet honey butter of sorts, so good I could’ve spread it on rocks and happily eaten those too. Admittedly doesn’t look like much, but let me tell you, they make up in taste what they lack in fancy presentation. My sister’s entree was the food envy inducing beef tenderloin stir-fry, a glorious heap of scallion topped fried eggs, french fries, plump caramelized sweet plantains, grilled onions, and juicy tenderloin medallions, all served in a bowl and drizzled with a spicy cream made from rocoto chilli peppers. Every ingredient was bursting with flavor, the plantains so sweet and soft they were almost custardy, the beef just the perfect amount of pink and juicy, and the fries pure golden, starchy goodness. To match my sister’s bowl-of-awesome was my amazing crispy pork shoulder sandwich and crunchy plantain chips. A thick smear of spicy mayo, a colorful, tangy red onion salsa, and my favorite surprise element, a soft, almost buttery, sweet potato wedged right in with the crispy pork shoulder, which was tender and testy, with perfectly burnt edges for that bit of charred flavor. A downright magical way to start a Saturday. And because even brunch calls for dessert, we split the only one on the brunch menu, a bowl of chocolate sorbet and lucuma cream, made from a Peruvian fruit with a mapley, butterscotch flavor. To top if off were wafer-like crisps made from cappuccino foam. A mix of flavors and textures and now I have a whole new fruit that I love! Success all around! Don’t let looks fool you, this dessert is a solid TEN. Since originally writing this a couple of days ago I’ve also been back for dinner and drinks and I can tell you, my llama love is stronger than ever. Once one of my favorite animals, now one of my favorite restaurants. My sister and I are separated by roughly 1,200 miles (1,276.3 if you ask Google) and because I have a slight aversion to Miami, where she still lives, and she’s been to New York a bunch of times, we thought we should get together in a whole new city. Our requirements were that our destination be no more than a couple of hours away by plane, have fun things to do (the younger De Angelis isn’t one for poolside lounging or beach bumming) and have lots of good food. So off we went to Atlanta, to do our sister bonding with a side of southern comfort. Many a calorie was consumed by way of fried, butter-laden southern specialties, but we both agreed the best meal of the trip (though possibly the worst for our waistlines) was at Mary Mac’s Tea Room, the kind of bright, sunny restaurant that fills up with bustling families and church ladies in their Sunday best, all packed in for heaping plates of artery-clogging southern goodness and tall glasses of sweet tea. Plain table bread? Psshh, not here, folks! 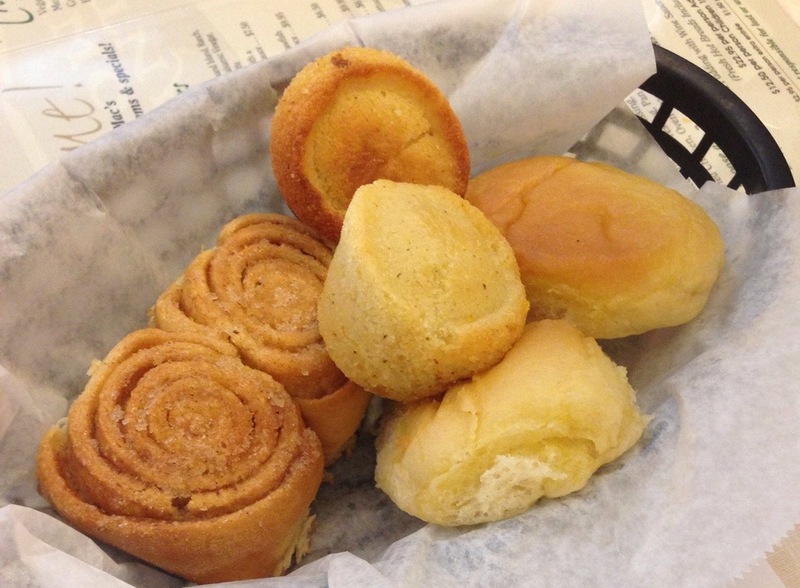 Right out of the gate, Mary Mac’s starts you off with a basket of sweet morning buns and cornbread in place of regular ol’ bread. Morning buns, with their sweet cinnamon bun-like swirl of brown sugar, were an interesting way to start things off, almost dessert-y and a nice complement to the more savory butter-slathered cornbread. Oh you know, just a little light lunch. 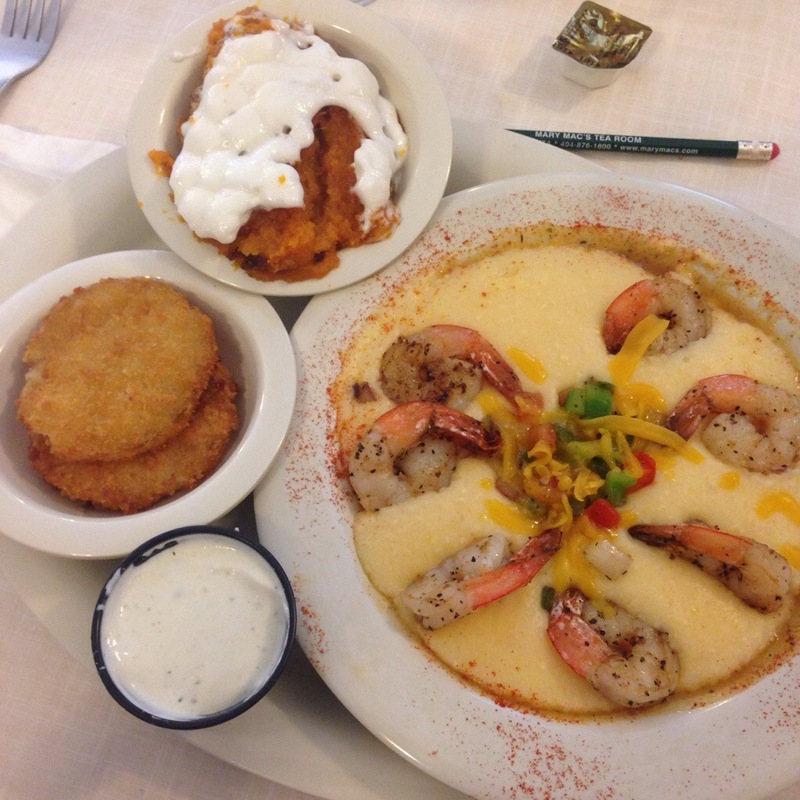 While the options were many, with seemingly endless combinations of carbs on carbs on carbs, I went with the shrimp and cheese grits with fried green tomatoes and my all-time favorite, sweet potato soufflé, as sides. The cheese grits were all of the creamy, buttery, cheesy perfection I needed them to be, with fat, juicy shrimp plopped on top, and the fried green tomatoes, tangy and juicy inside their crunchy, battered shells were the ideal companion. But by and far, my heart was won over by the sweet potato soufflé, all creamy and smooth, caramelized marshmallow sitting on top like a dream. Fried chicken, dumplings and mac and cheese…trifecta of deliciousness. 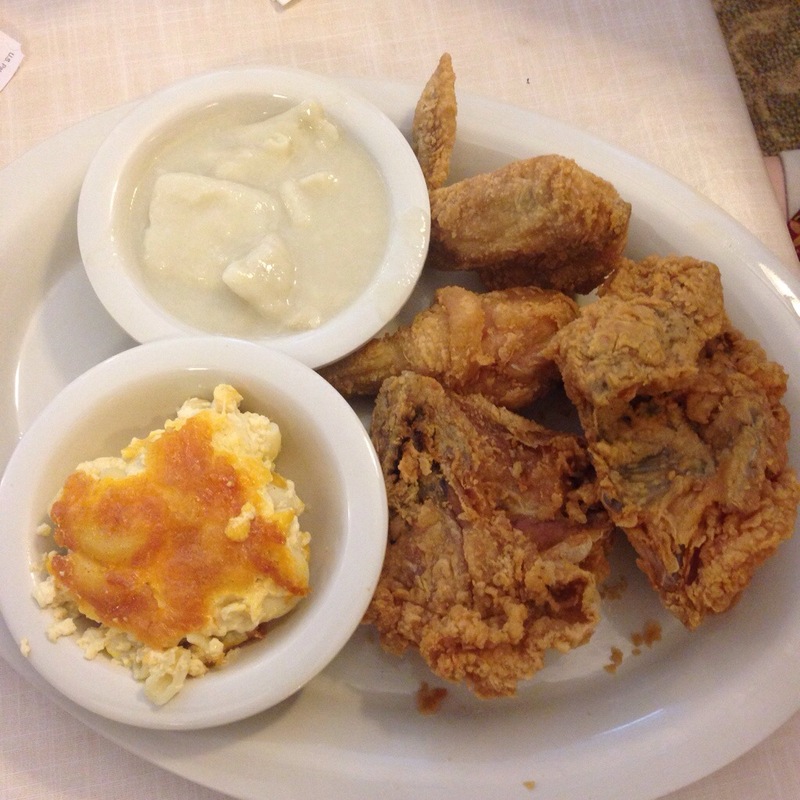 The other De Angelis went with fried chicken (because really, when in Rome…), mac and cheese and dumplings. The chicken, a giant, hulking affair of crispy, crunchy skin and tender white meat paired well with the softer, creamier sides. The dumplings, thick and soupy in their gravy like sauce were like the ooey, gooey, cheesey mac and cheese in rich, over the top southern goodness. Peach cobbler, cause there’s always room for something sweet. 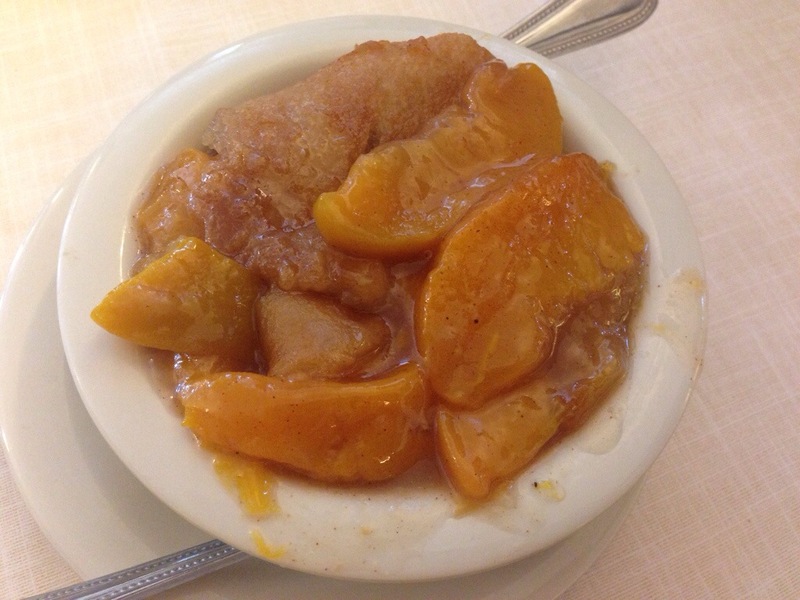 Finally, even with all of that in our systems, we squeezed in dessert: a shared portion of Georgia peach cobbler. Unlike the cobbler I ate in bed back at the hotel, this one was all fruit, no crust. It was good, the stewed, spiced peaches soft and warm, but definitely could’ve used at least a little bit of ice cream. Cause hell, after you’ve had that many calories, what’s another couple hundred? We left completely stuffed, ready for deep, long naps, and happily bordering on discomfort by the amount of good ol’ Georgia comfort food we put back. It’s a big surprise to absolutely no one that Thanksgiving is my favorite holiday of the year. More than Christmas, more than my birthday, certainly more than Valentine’s Day (really, whose favorite holiday is that? No one.) Thanksgiving though, is seriously my jam. And as such, I’ve been all sorts of excited in the weeks, now days, leading up to it. When I recently read about Zucker Bakery in the East Village and their seasonal Thanksgiving donuts, my head practically exploded. Thanksgiving AND donuts? Combined into one thing? YES. They come in four flavors: cranberry turkey, turkey gravy, cranberry, and sweet potato. Due to a mix up with the order I placed (because duh, I placed an order) cranberry wasn’t available, but I made sure to get my grubby little fingers on the other three. For savory pastry lovers, the turkey gravy donut is the way to go. This spiced pumpkin donut stuffed with gravy and turkey is a definite departure from its glazed and frosted cousins of the donut world. It would make a great lunch paired with soup, in my opinion. 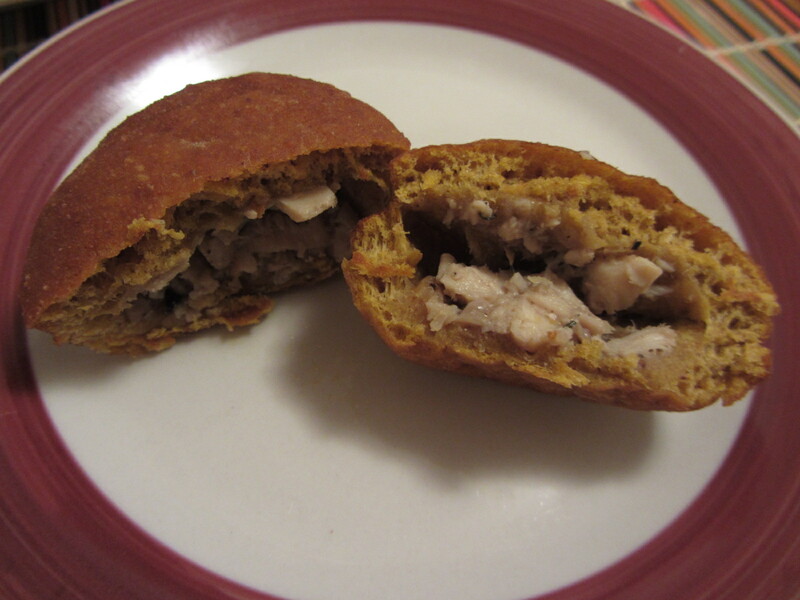 A donut stuffed with turkey and gravy? God, I love the holidays. 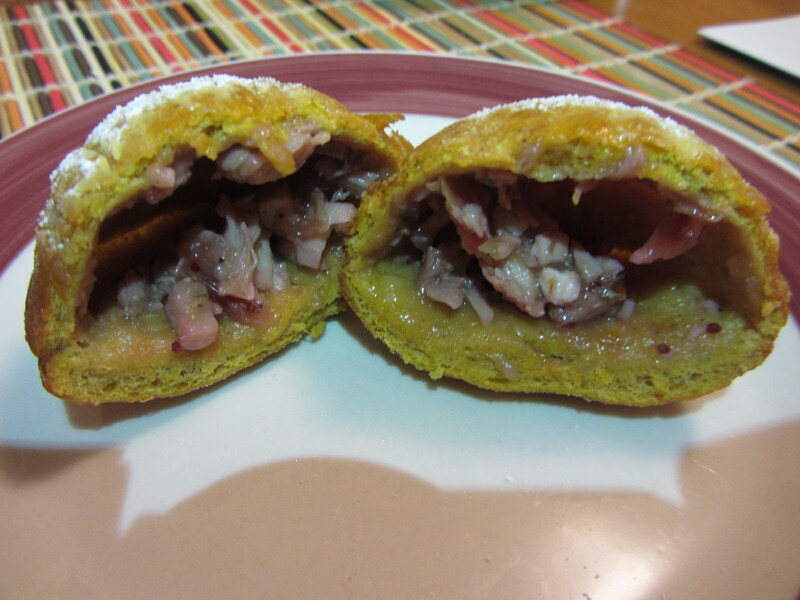 Turkey, gravy and cranberry sauce… all inside a pumpkin donut. Uh huh, that’s right. 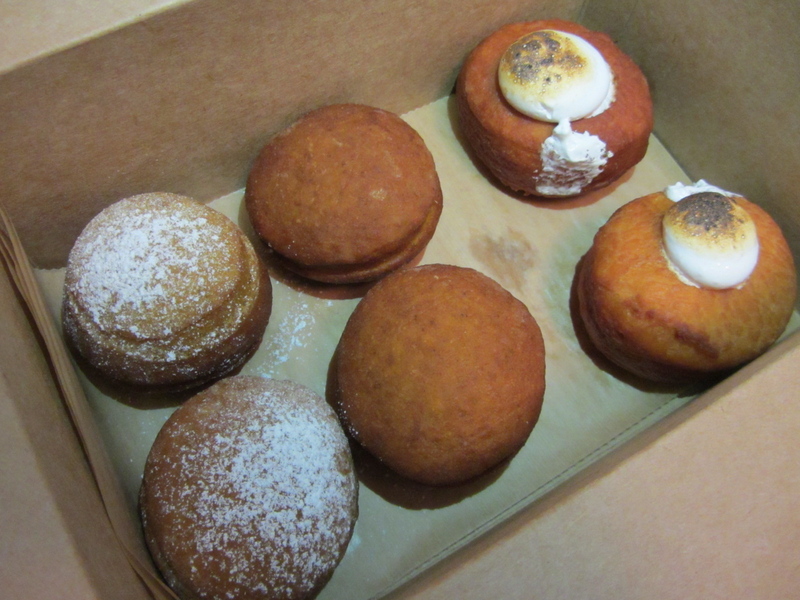 But because I’m a complete sugar junkie, my favorite was the sweetest of the bunch, the sweet potato pie donut with marshmallow filling. Like the pie itself, the sweet potato part of this isn’t super sweet, but the delicious glob of fluffy marshmallow cream inside? Well that’s pure, sugary perfection… especially warm and just out of the oven the way I had it. Thanksgiving donuts, a new thing for me to give thanks for this Thursday! I’ve never been one to let a little cold weather get in the way of me stuffing my face full of ice cream. (I mean, what, am I supposed to subsist off soup and tea during fall and winter? You know how long that is in New York??) So even with a crisp autumn chill in the air this weekend, I dragged Flaneur with me to find the Coolhaus NY truck, a Los Angeles food truck dishing out gourmet, artisanal ice cream sandwiches. 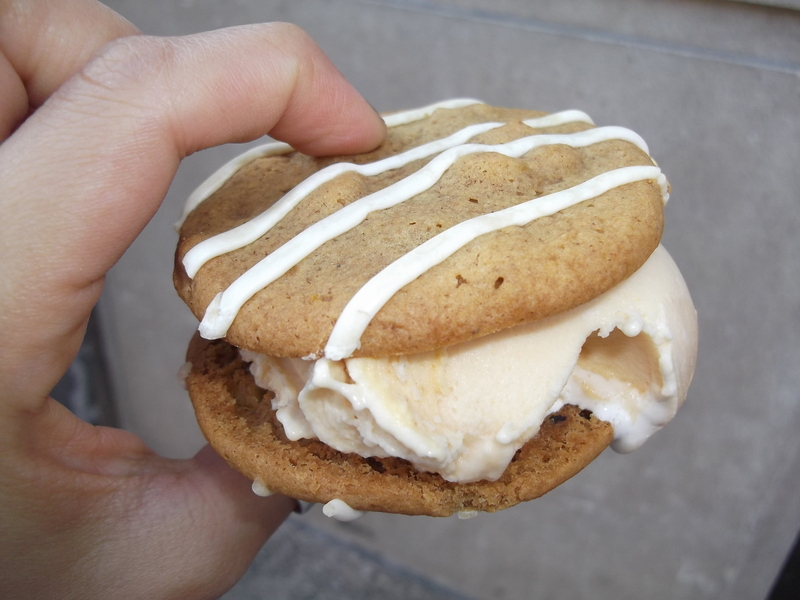 The ultimate fall ice cream sandwich: sweet potato ice cream and pumpkin spice cookies. Mmmm mmm mmh! With combinations like blood orange and cranberry ice cream and snickerdoodle cookies, and brown butter ice cream with candied bacon and red velvet cookies, I had to put some serious thought into what ice cream and cookie combo I wanted. In celebration of the beautiful fall weather I went with sweet potato and marshmallow swirl ice cream between pumpkin walnut spice cookies with cream cheese frosting drizzled on top. My chocolate chip cookie-loving-beau, on the other hand, opted for the Maker’s Mark bourbon pecan pie ice cream between chocolate chip cookies. Both were ridiculously good, perfect for either a sweltering day in July or a January blizzard. The pumpkin walnut spice cookies were pillowy soft and sweet, without being too much (I promise!) and the ice cream was rich, creamy, and with a more subtle sweetness than its flavor inspiration might make you think. It had just enough of the spicy sweetness of sweet potato and just the right hint of sugary marshmallow to make it the ultimate fall ice cream sandwich. If I could buy these packaged and by the dozen, I would bring them to every holiday party from here to New Year’s. Chocolate chip cookies and Maker's Mark bourbon pecan pie. BAM! Flaneur’s was good too, with the same autumn themed flavor but different individual tastes. His ice cream for example, had more of a smoky smoothness from the Maker’s Mark but still had the spicy, syrupy holiday sweetness of pecan pie that makes you want to sit in front of a Christmas tree and eat until you fall into a happy food coma. His cookies, unlike mine, were a little firmer and had a more traditional cookie crunch. 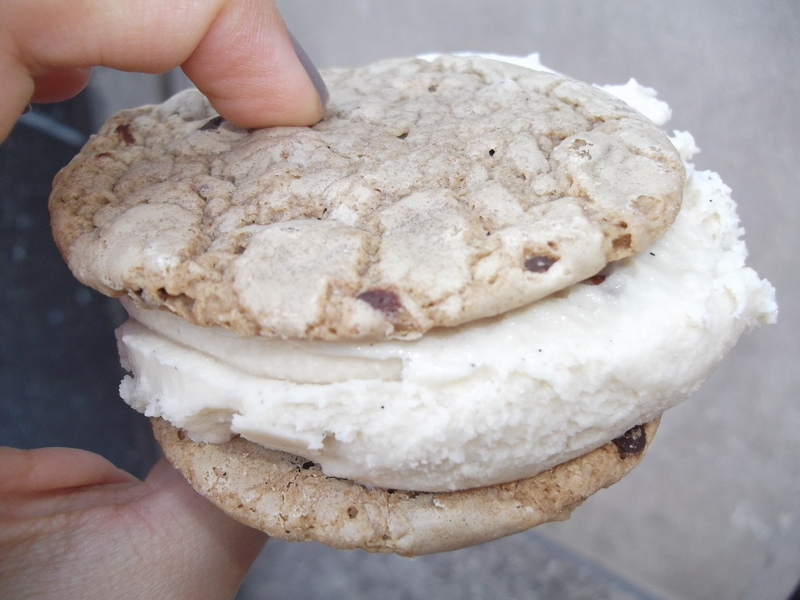 Lucky for my waistline, the Coolhaus NY truck changes location every day, because if I always knew where to find them every day, especially if it was as easy as it was this weekend when it was parked in Union Square…oh boy, that might be trouble. I might look like Santa Claus come next fall. As we wind up our last couple of days together before another obnoxiously long (two and a half months to be exact) time apart, I’m squeezing in as many reminders that America, New York, and I (duh) are all awesome and very much worth coming back to. As part of my plan, I wanted to eat something really great, something I knew he couldn’t get back in the Old World, something to remind him that home was here too: comfort food. Even though it’s not officially summer for almost another two months, Sunday in the city felt like summer had come early. Up till now, warm days have still brought a cool breeze with them, the kind that have you toting around a light sweater or give you goose bumps if you sit in the shade. But not this Sunday. Even as the sun slipped away for the night, the air felt thick and hot. The slight breeze, like when you turn a fan on in an unairconditioned New York City apartment, didn’t do a lot in the way of cooling. When the weather starts to get hot like this, I generally don’t like to do much. Movement equals sweating and sweating equals cranky, frizzy haired, shiney-faced Angie. But if there’s one thing I think is only made better by rising temperatures and sticky afternoons, it’s eating barbeque. The sweet tanginess of barbeque sauce smothered over a hunk of meat and the refreshing bite of a cold beer were absolutely made for enjoying in hot, humid weather. When the weather gets sloppy, turn to sloppy food. Which is why on Sunday, when the sun poured into our bedroom while dust bunnies collected in the kitchen cabinets, Flaneur and I decided to venture north to Harlem for lunch at Dinosaur Bar-B-Que. The walk to and from the subway and through the quiet streets of Harlem under the Riverside Drive Bridge was enough to get a healthy sheen of glistening sweat going on our foreheads. As we turned the corner on Dinosaur’s street, the thick, sweet smell of barbeque wafted out, heavy on the warm air. This had been the best idea ever. 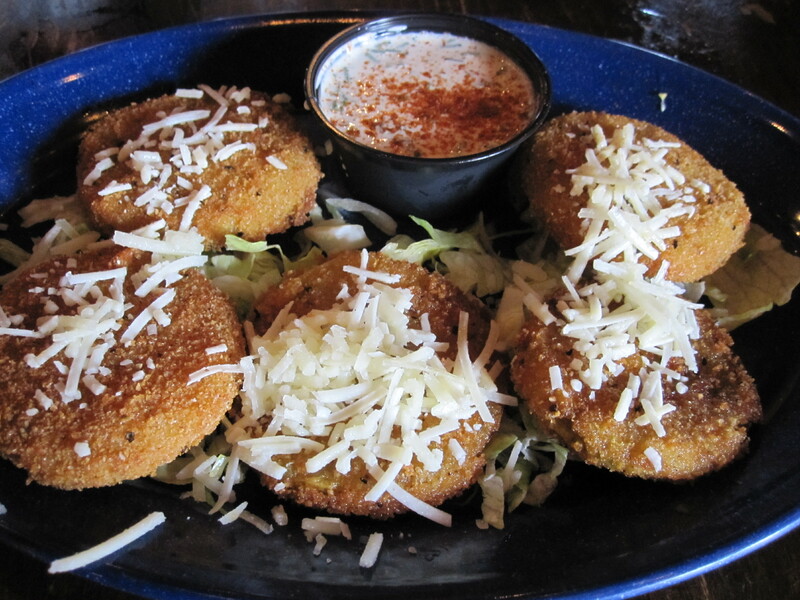 We started off our uninhibited Sunday lunch feasting with an order of fried green tomatoes, a Southern staple, and another food that conjures up images of slow, summer afternoons for me. They came battered and fried in a golden, not-too-thick layer of crispiness and were topped off with shaved Pecorino romano, a strong, salty cheese that played off deliciously with the unripened tomatoes inside. Usually I’m not crazy about ranch dressing, but the cayenne buttermilk ranch dipping sauce that came with these added the perfect little kick to each fried tomato bite. With every server that walked by, arms extended and strained under plates stacked high with ribs, mounds of potatoes and cornbread rolls, my stomach growled louder and louder. The smell alone was driving me crazy. So crazy in fact, that the first thing I did when our food arrived, on two large sectioned plates loaded with barbeque comfort deliciousness, was to accidentally knock my cup over and send the last couple inches of ice water remaining gushing over Flaneur’s half rack of ribs. Clearly, the heat does things to me. Bad things. Things that result in hot meals being doused in cold water. Luckily, due to some fast thinking, quick spooning out of ice cubes and the speedy response of a dozen napkins, the ribs were salvaged and we got to eating. I opted for the pork brisket plate, which came with both pulled pork and sliced brisket in addition to two sides of my choosing. I’ll be honest and say right now, that while I enjoy barbeque, I’m more of a sides-fan than a meat lover. I went with the mac and cheese, which was thick and creamy with a warm, off yellow color, instead of being a garrish school-bus yellow. The thick cheese baked on top was a nice contrasting touch in textures and was topped off with just a light sprinkle of deep red cayenne pepper. My other side was roasted whipped sweet potatoes laced with a spicy hint of cinnamon and topped with ground nuts. It was almost mousse-like in its consistency and the taste was buttery and smooth. But the main attraction at this celebration of meat was the soft, juicy pork. The pulled pork, which came topped with a bit of salty, sweet barbeque sauce, was tender and flavorful. Each bite literally melted in my mouth and seemed to soak deep into my taste buds. The sliced brisket was just as soft and juicy, with the rosy pink color I love in meat. (Well done? Blegh, yuck.) Just a little bit of fat on the side made it burst with flavor without being too fatty or gummy. 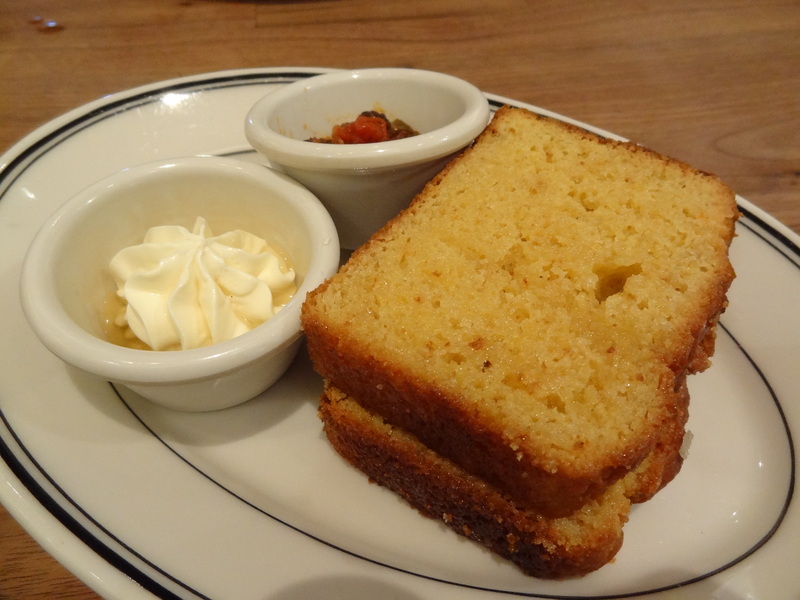 And finally, there was the cornbread roll, which although it was a little dry, still had a sweet, buttery taste. By the time I got around to it I was so stuffed, it wouldn’t of mattered how good it was. I had to stop eating. Flaneur, never one to shy away from getting down and dirty with his food, ordered the messiest of all menu items: ribs. 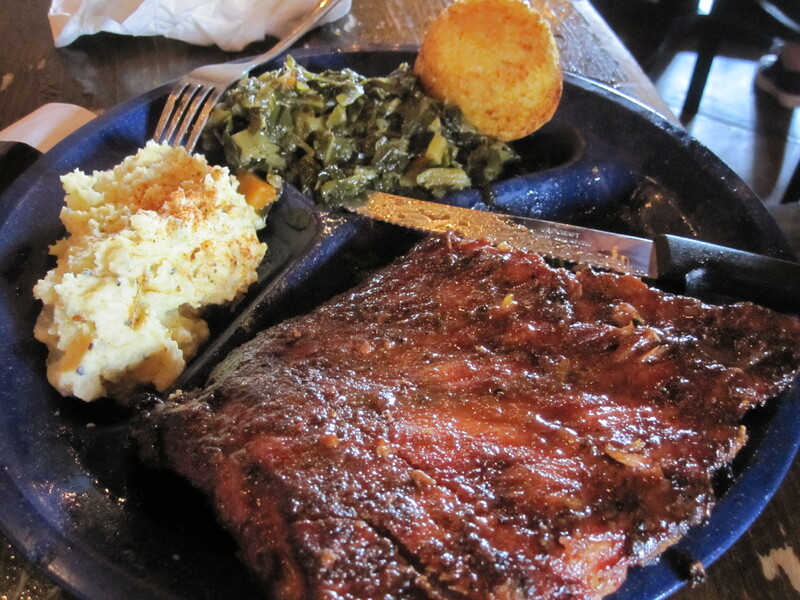 The half rack of pork ribs were wide and intense, a meal only for a serious carnivore. He gave me a rib and I ripped off a chunk of meat, getting barbeque sauce all over my fingers and face. 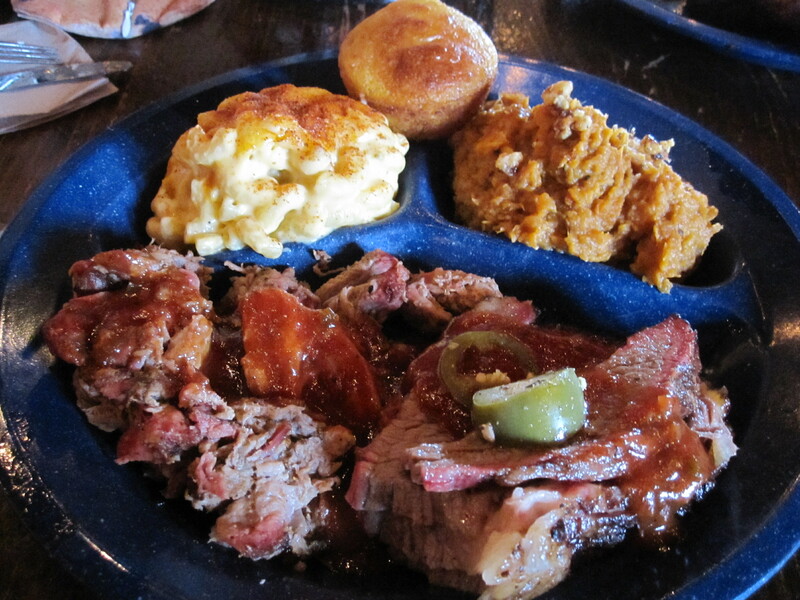 It was thick and juicy, dripping with the smoky flavors of carefully seasoned meat cooked over a fire. I think I made the better choices when it came to sides selection but his weren’t bad either. The Creole potato salad was chunky and thick, with fat hunks of potato rolling in an onion-y, spiced mayo, sprinkled with “Creole powder” which tasted like a blend of spices like cumin and cayenne pepper. His other side, another Southern classic, were greens, cooked and served in a buttery, oily blend of spices. These were much better than the potato salad because of how packed with deep, rich flavors they were. Plus, you can get potato salad at almost any deli on any street in any neighborhood in this city, but good greens, now that’s not as easy of a find. I had originally wanted to get dessert because there seemed to be some promising items on the list (including a banana and coconut cream pie) but after our plates were taken away with only cornbread crumbs, faint smears of sauce and in Flaneur’s case, clean bones, there was no way I could fit anything else in my stomach. As the sun beamed down on the concrete outside and the warm air blew in through the window, all I wanted to do was take a nap in a hammock somewhere, preferably on someone’s wrap-around porch. But there was none of that. We were a pretty decent way from home, and so with the content lethargy of people who’ve eaten entirely too much, we started a slow meandering walk on a hot afternoon in Harlem. A big accomplishment for me. When I watch cooking shows or thumb through cookbooks, I gaze at their finished results with the same awe I’ve been watching the Olympics with. Wow. I wish I could do that. Like becoming an Olympic athlete, being a cook takes training, practice and if you ask me, some level of innate skill. All of which explains why I’m terrible at cooking (and sports, but that’s a whole ‘nother discussion). “Angie,” she would groan, exasperated, “how will you ever get married if you can’t cook? You need to be able to cook for your husband, you know. Boy, am I eating my words now. Cooking in college wasn’t great practice either. I mostly lived off macaroni and cheese, sandwiches, salads and anything that came in a box, bag, or other package and could be nuked in a few minutes. And as far as natural ability– yea, I have none. My mom isn’t great and I never knew my grandparents well enough to comment on their cooking, but if anyone in our family had a culinary gene, I didn’t get it. Oh and my dad? His idea of a good dinner is a Burger King Whopper and half a carton of rocky road ice cream. That’s the gene I got. Usually the result is edible but slightly undercooked, overcooked, mushy, rubbery, unsalted, greasy or just plain ugly. Which is why, on those very rare occasions when I manage to actually pull something off in the kitchen, I’m very proud of myself. Especially if it was something that didn’t come from a mix or other prepackaged easy-way-out form. Recently, for a dinner at home with Flaneur, we divvied up the cooking and decided that he would make steaks and I would be in charge of a vegetable side. I could’ve taken the easy route and thrown some brussels sprouts or broccoli into the steamer, but I felt like trying something new. It wasn’t so much that I was up for a challenge, but more that I wanted something sweet: I had sweet potatoes on the brain. But not just regular sweet potatoes, which I’ve cooked before as fries (charred black on the bottom, limp and mushy everywhere else) and steamed in big chunks (seemingly ok from the outside, hard and undercooked at the core). I wanted sweet potato casserole. Now, I’ve never made sweet potato casserole but I’ve eaten it in large quantities, mostly at Thanksgiving dinners where I always get seconds and thirds and sometimes, if no one is looking, fourths. After a run to the supermarket, I came back and went at it with no recipe, just a vague idea of what to do. First I boiled three big sweet potatoes (skin and all), cut into smaller chunks, for about 10 minutes until they were soft. Then I took them out and with Flaneur’s help, mashed them with a fork until I had bright orange puree. Strictly eyeballing it, I added about half a cup of milk, maybe two tablespoons of butter, and a generous sprinkling of cinnamon. I then stirred it into an even, sweet smelling paste and transferred it to a baking pan. Then the really fun part: marshmallows. 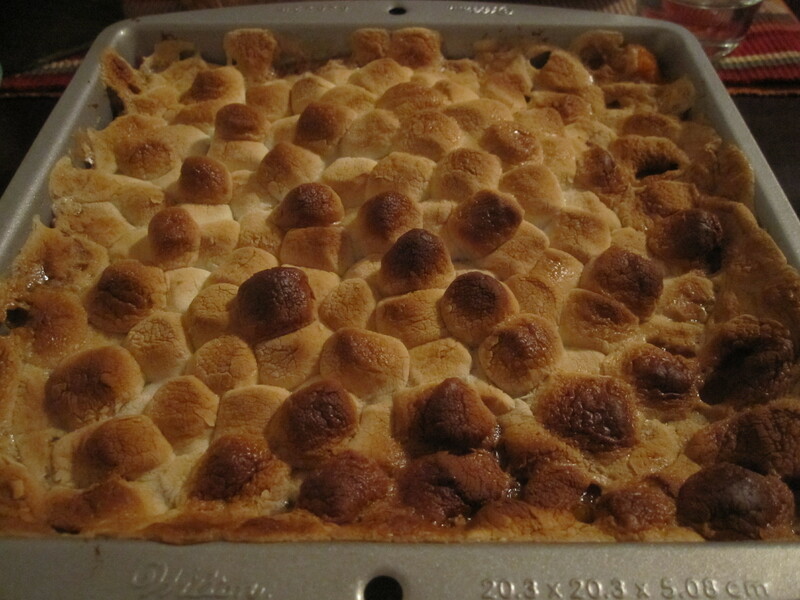 I covered the orange sweet potato blend with a thick layer of fluffy white mini-marshmallows, popped the pan in the oven for about 30 minutes and voila! When I pulled open the oven door, a warm delicious burst of that spicy sweet cinnamon smell reminiscent of so many Thanksgivings past, filled the tiny kitchen. If I could bottle that smell, I would spray it in my apartment till the air was foggy. The marshmallows were toasted to a nice gold color. No charring. No burnt smell. So far, so good. The true test, however, would be in the taste. 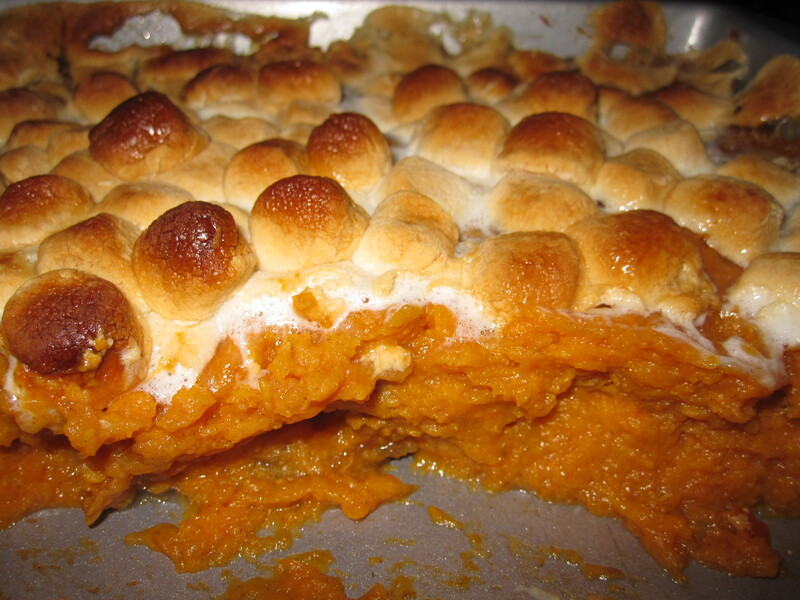 Digging the serving spoon into the pan, I pulled out a steaming orange heap of mashed sweet potato, the melted marshmallow making little strings of white, like gooey cheese on a pizza. Verdict: delicious! It looked good AND tasted good! Practically unheard of when I make food. In fact, it was so good that Flaneur and I finished it off by the next day, eating a cold spoonful here and there throughout the day. That’s how good it was: you could it eat cold and it was still yummy. So why write about a side dish that even the most elementary cook can whip up? Well, because it’s renewed my hope in becoming better at cooking. Maybe there’s hope for me yet. Maybe I can learn to cook things that are not just edible, but actually delicious. Maybe my cooking will be so great that I’ll have a line of suitors out the door, all begging for my hand in marriage and my cooking for the rest of their lives. Or maybe, just maybe, I’ll win the lottery and spring for that personal chef I’ve always wanted.